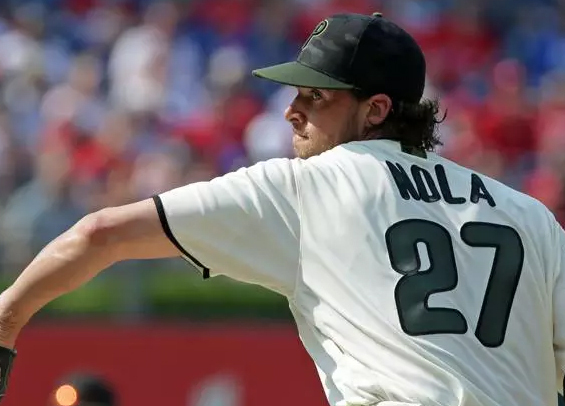 The Phillies and Aaron Nola have an arbitration hearing scheduled for Valentines Day, the hurler revealed Monday night to reporters in attendance at the Philadelphia Sports Writers Association dinner. Nola, 25, is seeking to be paid $6.75 million next season. The Phillies filed at $4.5 million. It's possible for the two sides to come to an agreement before the hearing, though given the difference in figures that seems unlikely. The potential exists though for the two to structure a contract extension that will include an increase in compensation for 2019 and beyond. Nola finished third in the National League Cy Young Award voting this past season, posting a 2.37 ERA over 212 1/3 innings. He earned just $573,000. The arbitration panel will hear arguments from both sides regarding the potential salary for 2019 and select either one figure or another.